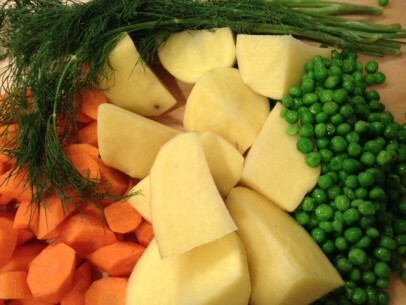 Carrots, peas and potatoes swim in a garlicky good light tomato sauce flavored with fresh dill. Fresh dill is a key ingredient here. If you don’t have any around, put this dish off for another day. Vegetable stew is a great way to use winter vegetables and cooks up in no time at all. A few ordinary ingredients make this an extraordinary meal. I like to use large yellow potatoes cut into quarters and if you can’t get fresh peas, its fine to use frozen. If you’re going with frozen, just take the time to thaw them before adding to the pot. Remember to cook the carrots and peas in the sauted garlic/onions, dill and tomato paste together before adding potatoes and water. It takes only a few extra minutes and makes a world of difference to the finished dish. 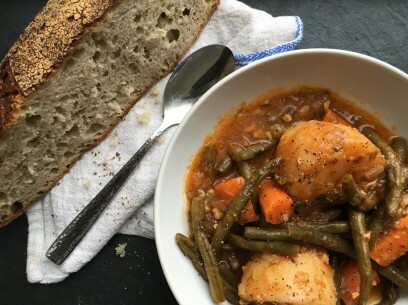 And this is a wonderful make-ahead dish as vegetable stew is always better the next day. Even though you may be very tempted, try to wait at least an hour after removing the pot from heat before serving. It needs to settle a bit and will be worth the wait, I promise! I most often use a 6 qt pot and that can hold double the recipe if need be. For a single recipe, it holds everything nicely and gives you enough space to stir freely. My 6qt pot is a large oval shape with a larger bottom surface that works well when you need to first sauté aromatics before adding the rest of your ingredients. I find it is easier to work with than a deep soup or stock pot with a dish like vegetable stew. Saute onions and garlic in olive oil on low heat until soft and translucent. Add fresh chopped dill, salt, fresh ground pepper, tomato paste dissolved in water, carrots and peas. Stir everything together well and cook for five minutes. Add potatoes and 7 cups of water, enough to just cover potatoes and cook uncovered over medium heat on a low boil for 40 minutes or until potatoes and carrots are fork tender. Allow vegetable stew to rest for at least an hour and as much as 24-48 hours before serving. This recipe serves 4-6 servings and I’ve both doubled and tripled it with fine results. I noticed that olive oil was listed twice, in 2 different amounts. Can you please clarify this. Thanks. Hi Kiki! Do you think this recipe could be done in the crock pot? The link to your book doesn’t seem to be working. Is it still for sale, as I’d love to buy it. If using green beans instead of peas, what amount of green beans should we use? Would you add the green beans at the same time as the carrots, or later? This was SO delicious. I loved it with green beans. I made it vegetarian and fried fish on the side with garlic, dill, and lemon for non-vegetarians and they mixed it in and made it into a fish stew. It was yummy! This was so good! I used green beans and only 3Tbsp of the oil and only 3 of the yellow potatoes. Served it with Fried Bread (pizza dough). Made a stock pot full of stew, enough for 8 servings at least. Yumm-o!! 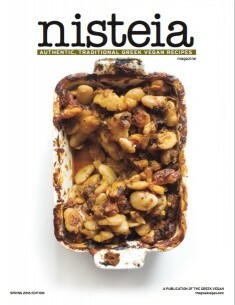 Eaten on the island of Aegina, a dash of Tabasco sauce gave it a bit of a kick.